Be aware that lane closings along New Kent Road from Dorchester to Westover Hills Boulevard can be expected in the next week or so, as the city mills and paves the street. The city will also be working on the traffic circles at New Kent Road and Riverside Drive and at intersection of New Kent Road and Bruton Road. Landscaped concrete medians and pavement markings around the circles will be installed. We’re thrilled that Westover Hills has been chosen to be on The Garden Club of Virginia’s Historic Garden Week House and Garden Tour (Wednesday, April 26, from 10 a.m. to 5 p.m.) Five Beautiful homes on Riverside Drive will be featured. Immediately following the Garden Club tour, WHNA will host a private “Twilight Tour” of the same homes — plus an extra garden– from 5 p.m. to 7 p.m. It’s only open to Westover Hills residents. WHNA needs volunteers to help with lunch sales during the tour. Local favorite, Kitchenette, will provide the lunches. There will be two one-hour shifts: Shift 1, from 11 a.m. to 12:00 noon, and Shift 2 from noon to 1 p.m. proceeds from the lunches will benefit WHNA. WHNA also needs volunteers to during the private “Twilight Tour.” We need hosts to help in each home during two shifts: Shift 1, from 4:30 p.m. to 6 p.m., and Shift 2: from 6 p.m. to 7:30 p.m. Cheers to Jennie Shaw and Katherine Whitehead for chairing this special event! Please contact Katherine at kgw5311@gmail.com to let us know if you can help. 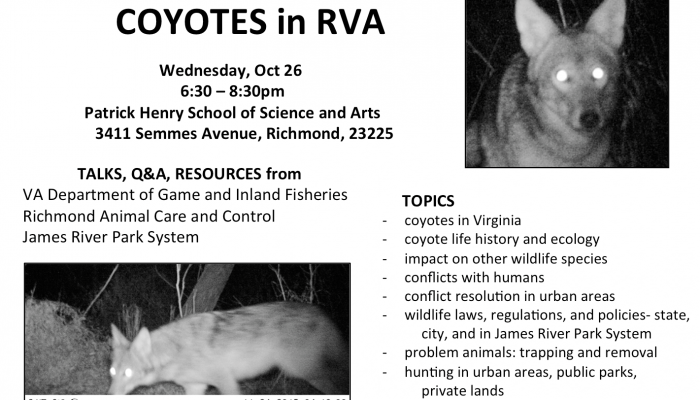 Due to the concern many city residents have regarding coyote sightings in their yards and neighborhoods, the Department of Game & Inland Fisheries is holding a citizens meeting on Wednesday, October 26, at 6:30 p.m. at the Patrick Henry School of Arts & Sciences on Semmes Ave. They will provide information and address any concerns. Kids ages two to 8 will have a great time at the special family storytime starring Nutzy, mascot of the Richmond Flying Squirrels. The event will be held at the Westover Hills Branch Library at 11 a.m. on Thursday, August 4. Children must be accompanied by an adult.